There are many reasons to visit the Dordogne. 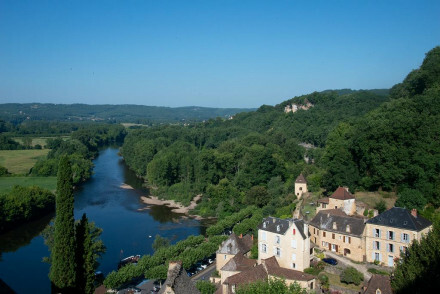 The wine, food and châteaux are obvious draws, but there are also picturesque rural villages, fascinating history - including some of the world's most ancient cave art, charming green, rural views, the beautiful Dordogne river and plenty of sunshine. 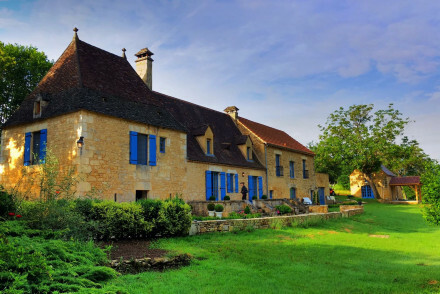 There’s a lot to see and a lot of terrain to explore, so instead of choosing just one of our Guru’s recommendations for the best places to stay in the Dordogne, you might want to book in to two or three. 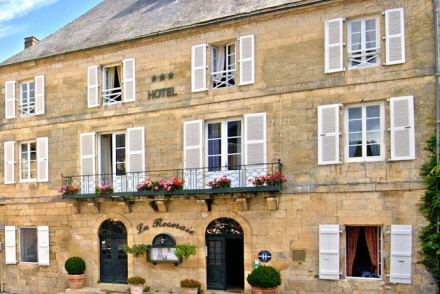 Many of the best hotels in the Dordogne are in the towns and villages dotted along the famous Dordogne river itself. Bergerac and Domme are good places to base yourself to explore its beauty and enjoy the myriad of water based activities. 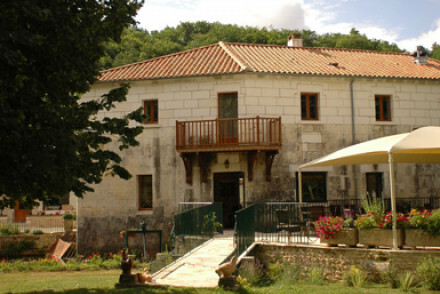 While Les Eyzies is the place to stay if you're interested in the ancient caves of the Vezere Valley. And Brantome (situated on yet another river - the Dronne) is a charming historic market town, often referred to as the "Venice of the Perigord". It's well placed for getting to know the north of the region or the Perigord Vert. But if you want to stay in the centre of the department, then book a hotel in Périgueux. it's got great transport links (both rail and air) and is a buzzy city with charming medieval old town - don't miss the cathedral which dates back to 1120 - and traditional French market, where you'll find everything from beach towels to oysters. The area around Sarlat specialises in truffles and mushrooms, foie gras and other duck and goose products. This is also a good town for dessert wine. One of the Dordogne's most familiar château is the Château de Beynac. Probably because the town and fairytale château star in films Ever After and Chocolat. You get a nice view of Château de Baynac from Château Castelnaud, which is a more work-a-day, fortress style construction. These days it's a museum, focussed primarily on the art of warfare in the Middle Ages. Inside there's an impressive collection of armour, weapons and furniture from the period. Outside are the reconstructed catapults! 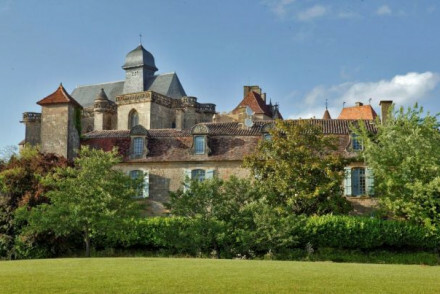 While Château Marqueyssac is best known for its wonderful verdant gardens. The most visited in the Perigord. Along the river banks these gardens are ripe for strolling, with all paths leading to the Belevedere, a fabulous balcony 192 metres high, with stunning panoramic views of the Dordogne Valley. Grotte de Lascaux, 2kms to the south east of Montignac, is one of the most famous sights of the Dordogne. A Palaeolithic cave complex with paintings approximately 15,000 years old. The cave art is spread through many cave galleries, and depicts mostly realistic images of large animals, though there are also some human hand prints. Brantôme is often referred to as 'The Venice of the Perigord', because of its five beautiful medieval bridges and the way the buildings hug the River Dronne prettily. 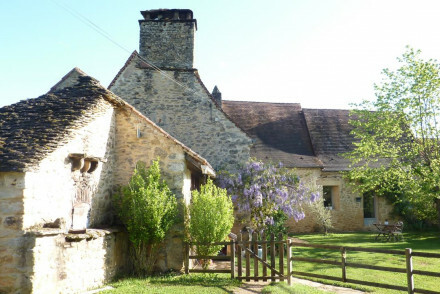 This is also one of the best places to stay in the Dordogne if you're looking for a romantic, peaceful base. Some of the Dordogne's best preserved medieval architecture survives on the tangle of small streets and squares of Sarlat-la-Canéda. Sarlat is also a good base for explorations into the Vezere Valley, where many of the Dordogne's famous cave systems can be found. There's a market happening somewhere in the Dordogne every single day of the year. And on the weekends there's often something foodie going on in almost every village. One of the largest ones is Sarlat-la-Canéda's Saturday Market. But don't forget to book well ahead if you're planning to visit the area in busy July and August. Many of the best places to stay in the Dorogne get booked up months in advance. Alternatively come in the quieter shoulder season, when the weather is still warm, but the crowds have long gone. For the complete château experience book a room in the Château les Merles, because it's a fairytale château in its own right! Surrounded by golf courses, vineyards and forests, it offers every luxury. In addition to its 18 rooms it also has two separate villas, so surprisingly it's also one of the best places to stay in the Dordogne for families. If you want château on a budget the Hotel Edward 1er is the perfect choice. It's a mini-château, complete with pointed turrets, in the lovely town of Monpazier. And prices start at €96 a night! 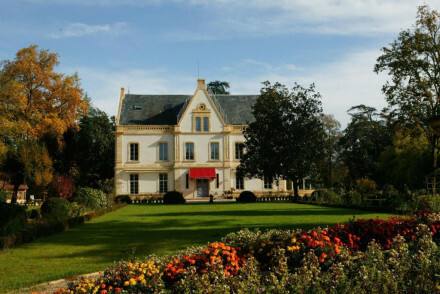 Château la Thuiliere is perfect for wine lovers. A renovated château this is quite a grand place to stay - all mahogany and dark reds. They also restrict children under 12, so it's an ideal choice for people looking for a romantic spot. The Château des Baudry offers an idyllic location, sumptuous food and delightful hosts, in a charming, comfortable setting. The five rooms all have their own fireplaces and unique antiques, plus there’s a beautiful courtyard and peaceful gardens. 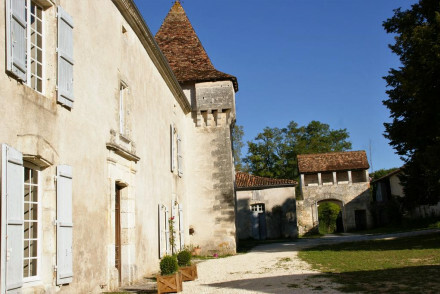 Château de Lalande is a charming property to the west of Périgueux. The style is traditional with floral wallpapers, parquet flooring and plenty of antique furnishings. You'll also find a gourmet restaurant serving fabulous food, and a pool for relaxing after a day's exploring. Once a farmhouse, La Villa Romaine’s buildings are beautiful, bright sandstone, set around a courtyard. All have lovely views of the River Dordogne and the gardens. It is also a great base for exploring all that the region has to offer. 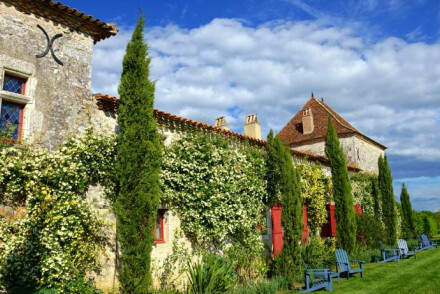 La Chartreuse de Bignac is a beautiful restored country house oozing style and charm. Think rustic chic interiors, plus excellent restaurant and stunning gardens with pool. 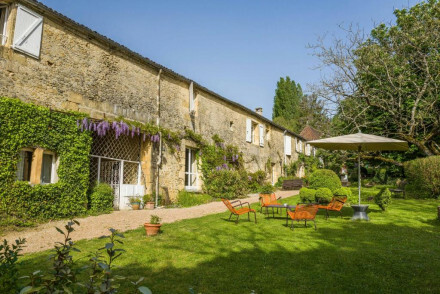 La Gueriniere is a five room, country house conversion dating from the eighteenth century. It comes complete with outdoor pool, tennis court and dining terrace. This is an ideal base for kayaking, exploring and generally enjoying the delights of Domme. Moulin de Vigonac oozes rustic chic. This converted 16th century watermill is just out of Brantome, situated on the banks of the Dronne. The ten stylish rooms offer all modern comforts and some have private terraces overlooking the river. 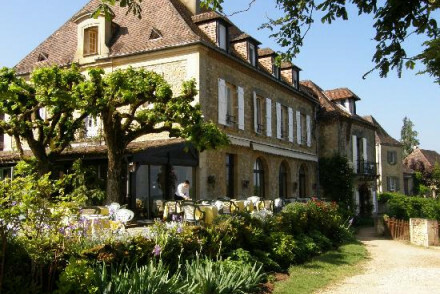 If you're looking for Michelin stars, Le Moulin du Roc is one of the best places to stay in the Dordogne. Near beautiful Brantôme, it's luxurious in the old fashioned sense, with generous rooms, all with their own private terraces. A romantic choice too! The Château des Vigiers is a vast 16th century château with 75 rooms - many with four-poster beds and all with lovely antiques. There’s a cosy spa and a Michelin starred restaurant. 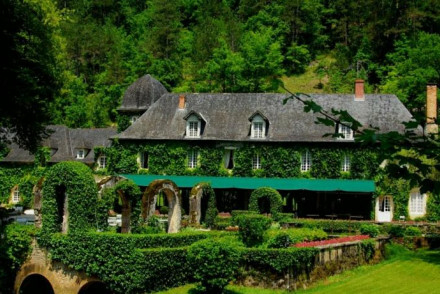 For beautiful river views and great food, you can't beat Le Moulin de L'Abbaye. 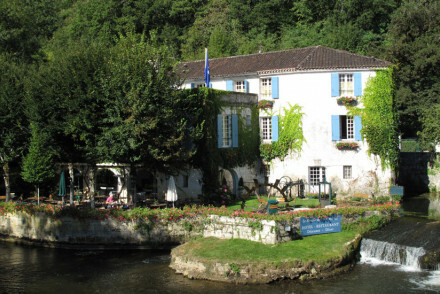 This old mill in the centre of Brantome has 19 charming bedrooms, and two excellent restaurants. 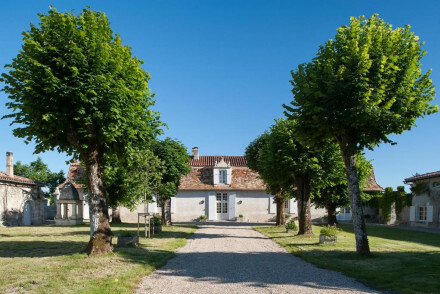 La Ferme Lamy is a 12 room stone and terracotta farmhouse conversion with simple, whitewashed walls and stone floors, and a wonderful terraced garden. As well as the pool terrace there’s also a breakfast terrace. Great for both families and couples. 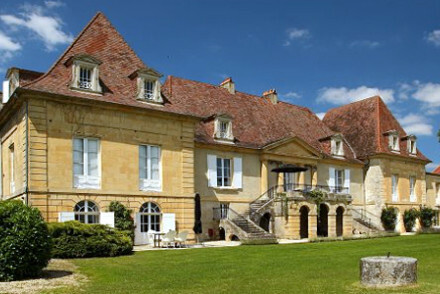 Le Chatenet was a family manor, and is now a family-run hotel, sitting on six hectares of estate grounds, which include a swimming pool, dovecote and tennis courts. Château de Maraval is a bijoux château which sits just outside Domme. A four bedroomed hotel, this is an adults only romantic hideaway. There is a lovely pool and spa. Hot air balloon trips are available nearby. The Château le Mas de Montet is a Renaissance-era château with fairytale-esque features and gorgeously renovated interiors. Think turrets and creepers and four-poster beds. It’s surrounded by 130 acres of beautiful gardens and parkland. Les Charmes de Carlucet is on an estate not far from Sarlat-la-Canéda. There are four simple, yet stylish B&B rooms in the main house and then two luxurious self-catering villas. There’s also an outdoor pool and it’s a great spot for exploring the region. 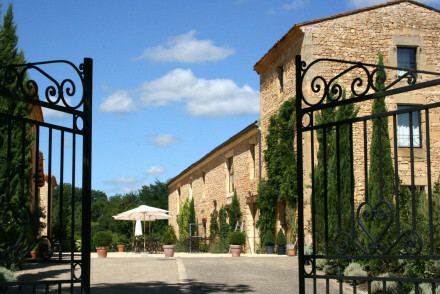 Not far from Bergerac, Le Prieure is an idyllic B&B close to Biron Castle. The rooms and apartments are charming and romantic, with exposed beams, antique furnishings and views of the shady terrace. Le Logis de Puygaty is a charming country house B&B with just three rooms and one cottage suitable for families. There’s also a garden and a pool. 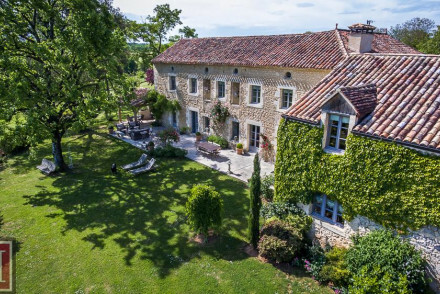 Mont d’Onel is a wonderful 13th century château-home sitting on a mound just outside Bergerac, and walking distance to a range of good restaurants. The views of the Dordogne valley are stunning. There are just five rooms with plenty of charm, which are priced from €135 per night including Breakfast. 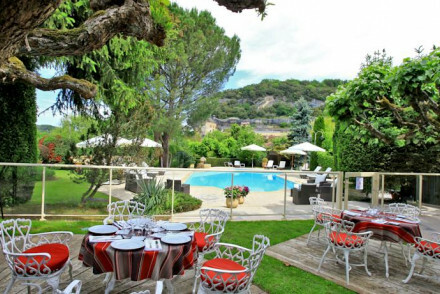 Once a coaching house, Les Glycines is now a 16 room hotel with chic, modern decor and a fabulous terrace restaurant. 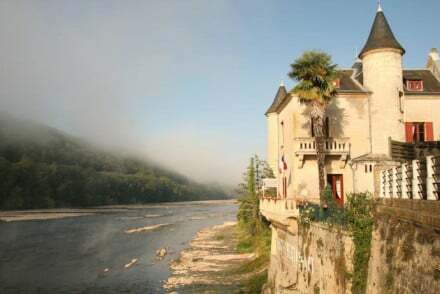 Relaxing, but also gourmet, this is a great base for exploring the Dordogne. 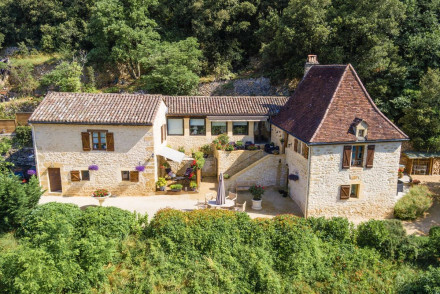 Le Moulin de L'Abbaye is, as the name indicates, an old mill, so you're right on the river, and have a collection of outdoor terraces, dining areas and sun traps in which to ponder the area's beauty and enjoy the local cuisine. A simple, rustic farmhouse with plenty of French charm, L'Auberge de L'etang Bleu feels like your home from home, surrounded by woodland. L’Esplanade is a family run establishment which offers great value (with rooms from around €90 per night) and spectacular views over the Dordogne. The Inn is perfect for a romantic break with its traditional feel and gourmet restaurant. Bergerac Dordogne Périgord Airport is just 3kms south of Bergerac. Or you might find Bordeaux-Merignac Airport more convenient, it’s an international airport only 9kms from the centre of Bordeaux and about 90 miles from Périgueux. A lot of major airlines service Bordeaux, and if you can’t get a direct flight you’ll have no problem transferring in Paris. Finally there is Brive la Gaillard, on the region’s north-east edge, about an hour from Périgueux. The Eurostar from London St. Pancras to Périgueux, via Paris and Limoges, is also a good option. If you want to hire a car - which we strongly advise if you want to explore the Dordogne - we recommend you visit our online partner, Rentalcars. Dordogne has a mild climate, with cool winters and warm summers. And plenty of sunshine. So as far as the weather is concerned there’s no best time of year to visit. Sunny summer, with maximum averages hovering around 28°C, is probably the most popular time to visit, but it may be better to consider it as an expanded season and say that any time between April and October will be warm and sunny. if you’re visiting for truffle season then you’ll be wanting to arrive between December and March. 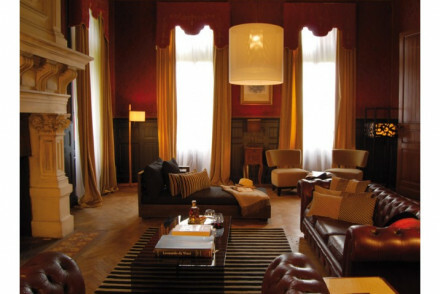 or consider the best places to stay in Bordeaux? A renovated country house standing amongst beautiful gardens. The interiors stand in direct contrast with the historic setting, expect clean, modern and minimalist. The rooms offer fabulous views. A tranquil spot to explore Perigeuex and the surrounding region from. 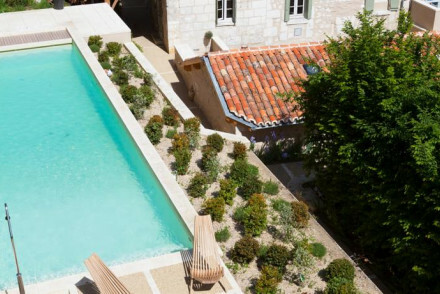 Total relaxation - After a day of exploring Perigueux, why not unwind in the sun by the pool with a chilled glass of wine in hand? Great walks - An endless horizon of gardens and landscape surrounding her, ideal for getting lost in. Sights nearby - The Vesunna Gallo-Roman Musuem is worth seeing, a near-perfectly restored Roman villa. 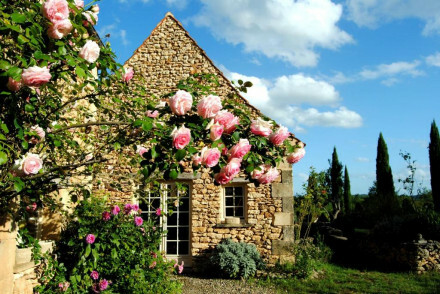 A simple countryside house with French charm. Cosy rustic reception rooms with fireplaces, wooden beams and stone walls. Simply decorated bedrooms with attached bathrooms. An understated country escape in the surrounds of woodlands. 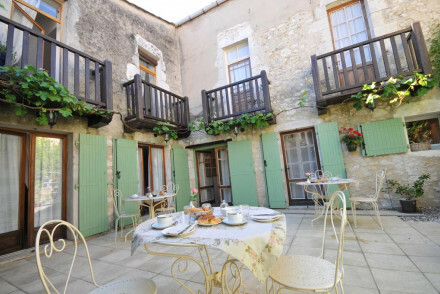 A charming guesthouse in the pretty town of Eymet. 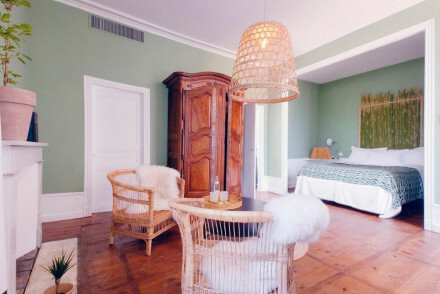 Rooms are traditional and cosy, yet unfussy, with white washed walls, wooden floors and cast iron beds. Indulgent breakfasts are served and there's a quaint courtyard to enjoy on summer days. A quintessentially French stay. Local exploring - Eymet is a charming historical town and well placed to access the sights of Dordogne. 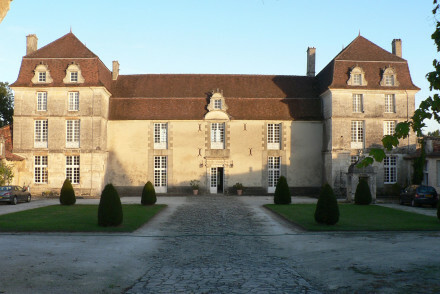 Sights nearby - Visit the Château de Bridoire a French castle located in the commune of Ribagnac. Great walks - Wander through the historic streets of Eymet and admire the timber houses. A glorious hotel set in a 17th century country house on the river, with spectacular views. Cosy rooms have exposed beams, wooden floors and rustic charm. Gourmet cuisine from the restaurant, outdoor pool, gardens, and large sitting room. Romantic, gourmet, and family friendly. Charming guest house not far from Sarlat-la-Canéda with an outdoor swimming pool, peaceful shaded garden and gastronomic restaurant. Beautifully stylish interiors feature sisal flooring, Persian rugs, antique pieces and contemporary bedrooms in cool earthy tones. A great hideaway & excellent value. Value chic - Exceptional value - the super chic rooms start from just €80 per night B&B. 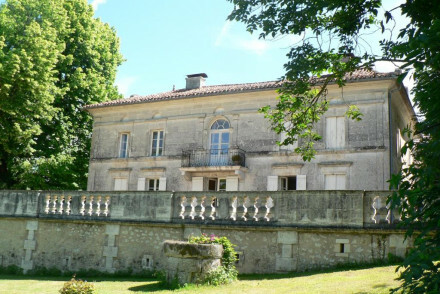 A classic 18th century country house in rural France in 25 acres of scenic parkland. The peaceful garden has an outdoor swimming pool, tennis court and terrace dining area. Bedrooms have hard wood floors and decorated in a farmhouse style. The small restaurant serves traditional French dishes. 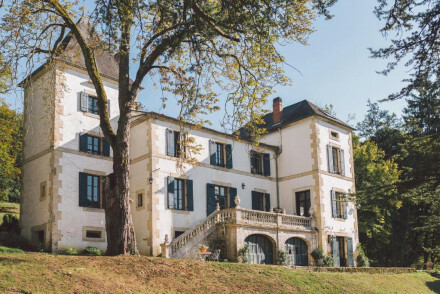 This historic château is nestled in the unspoiled Périgord countryside. Rooms are simply dressed, with crisp white linens highlighting the rich, dark wood floors. Attic suites offer extra living space, ideal for families. Enjoy homecooked French cuisine at the table d’hôtes. A warm, welcoming hotel. 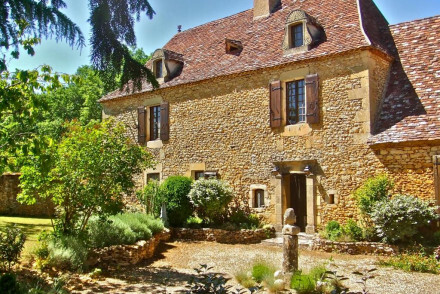 A characterful old stone house set in secluded mature gardens just a short walk from Sarlat's town centre. Traditionally dressed rooms are decorated with soft hues, antiques and feature exposed stone walls. A well priced option to explore the region from. Local exploring - Ideally positioned just a 10 minute walk from Sarlat town centre and with easy access to the region's main attractions. Sights nearby - Discover the fascinating prehistoric cave art in the Vézère Valley. Local markets - Sarlat’s food market is a must visit. 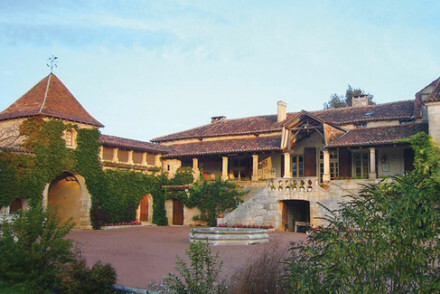 Les Charmes de Carlucet is an estate not far from Sarlat-la-Canéda. It offers four simple and stylish B&B rooms in the main building, and two luxury self-catered private villas for a more intimate getaway, plus a large outdoor pool. A great base for exploring the area for all the family. A charming guesthouse in the heart of the Dordogne and only 4km from Sarlat, offering traditional but quirky rooms. Interiors are traditional with rapiers and tapestries straddling the walls. Boasting an outdoor pool, library, ping-pong table and a BBQ. A perfect spot for a country retreat. Writing a novel - Overlooking the Dordogne river, perched amongst vineyards and woodland, this is a place perfect for finishing a novel. Sights nearby - The prehistoric cave paintings at Font de Gaume are well worth seeing and are only 30 minutes away by car. Great walks - Nestled in the countryside, there are lovely places to stroll. Charming accommodation with homely bedrooms in an old farmhouse. Rooms are clean and decorated in cool neutral tones with some original wooden features. Lovely garden with plunge pool and sit out terrace. Communal kitchen and on site restaurant. Great value in the heart of the Dordogne. A charming 17th-century farmhouse in the heart of Dordogne, surrounded by woodlands and picturesque walks. The pretty garden has a pool, while inside the style is simple and rustic, with bare walls and wooden beams. The hosts are ever-friendly and make hearty meals from quality local produce. 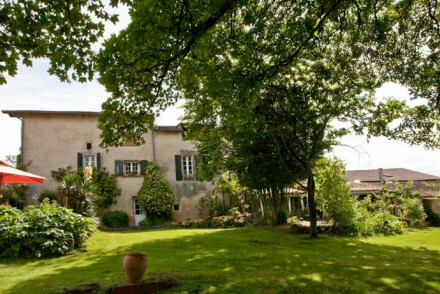 A delightful 19th Century mansion located in the medieval village of Montignac. Spacious, light filled rooms are a mix of traditional and contemporary, all are air conditioned. There's an inviting garden with swimming pool and sun terrace and the restaurant serves regional dishes. Sights nearby - The famous Lascaux caves are in Montignac and the charming town of Sarlat is close by. Spectacular views over the valley and river Dordogne and fabulous food. A traditional and charming village inn with tasteful bedrooms. A family friendly spot, also great for a romantic country escape. Views - Wonderful views of the river Dordogne and the valley. This charming B&B is set in Montfort in the Dordogne Valley. Dating from the 18th-century, the residence offers spacious rooms with original wooden beams and period furnishings; rooms look out over the beautiful natural landscape of the valley. Dine at the hosts' table at this elegant country hotel. 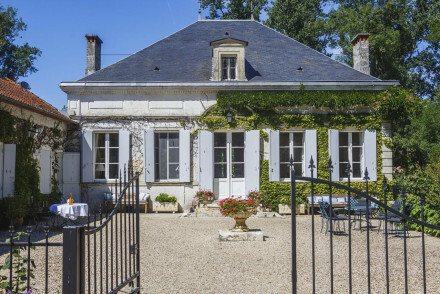 A quintessentially French country house set in beautifully manicured gardens. A handful of rooms are traditionally dressed with cast iron beds, exposed stone walls and beamed ceilings. Spend days lounging by the pool, taking long walks or simply unwinding with a good book. Country Escape - A picturesque rural house complete with pool and landscaped gardens. A French rural idyll. Charming B&B in the heart of the Perigord offering 4 elegant and spacious rooms, all with a private terrace. There is an outdoor swimming pool, sundeck that's great for sunbathing and beautifully-maintained gardens. A quiet and charming place that's ideal for local exploring or to unwind in. Writing a novel - A charming and quiet area of Dordogne that's ideal to escape the humdrum of urban life. Sights nearby - Dip your toes into the past and go to the Lascaux Caves, with their prehistoric paintings along the cave walls. Great walks - Nestled in the countryside, there are some lovely walks to be had here. 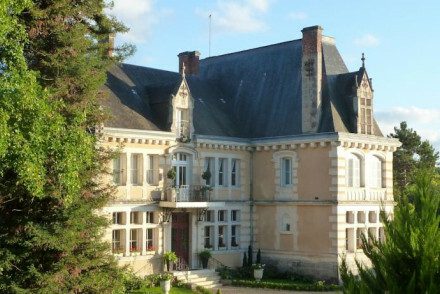 A glorious manor house on the banks of the river Coly in the Eastern Dordogne. Elegant rooms with Toile du Jouy wallpapers and river views. Fantastic riverside restaurant, swimming pool, and beautiful grounds. 4 cottages to rent. A charming family friendly home from home. A delightful little guesthouse set remotely in the heart of Périgord Noir. A rustic farmhouse with gorgeous rooms decorated in soft pastels with wooden floorboards and large beds. 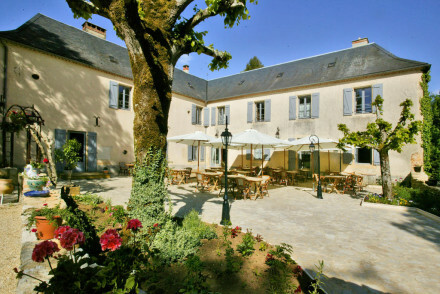 An excellent table d'hote, swimming pool, library, and bikes available to explore the area. Totally relaxing. Country Escape - A rural escape in the heart of the natural Périgord Noir. Sights nearby - Lascaux, Font de Gaume and numerous castles, gardens, and small villages along the Vezere. Traditional - A completely rustic farmhouse in a wonderfully rural setting. 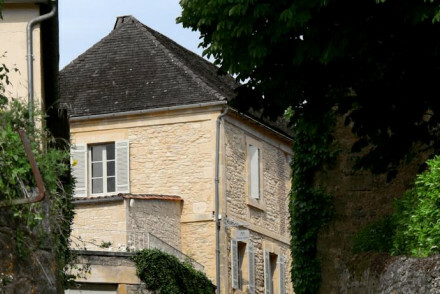 A 19th century mini chateau in the charming town of Monpazier. Antiques, marble fireplaces and chintzy fabrics in the rooms. Two excellent restaurants and a lovely swimming pool. A very characterful place to stay for exploring the region around. Local exploring - Caves of Lascaux, Castles of Biron, Castlenaud and Beynac. A pretty stone house decorated with pale blue shutters set in beautiful mature gardens. Traditionally dressed rooms feature elegant antiques and softly patterned French wallpaper. A fabulous restaurant served regional dishes and there's a large pool to enjoy in the summer months. Country Escape - A beautiful traditional house offering superb walks and a tranquil setting. Sights nearby - Visit the famed prehistoric art in the region safeguarded in caves. A beautiful sandstone farmhouse with sweeping views over the valley. Simple but chic rooms with wooden beams, four posters and linen drapes. Excellent restaurant and lovely swimming pool. Great outdoor areas perfect for wedding receptions or group celebrations. Views - Stunning views of the gardens and rivers. 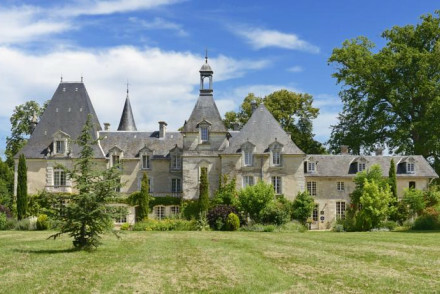 A striking chateau set in sprawling grounds. Traditionally dressed throughout with a choice selection of antiques, high ceilings and large windows. Featuring a swimming pool, tennis court and plenty of quiet spaces to curl up with a good book. Families - With a play area, plenty of space and a swimming pool children will be kept entertained. Great walks - Take long walks (starting straight from the property) through the picturesque countryside. Sights nearby - Discover some of the many castles in the region. A former coaching inn set in lush parkland. Contemporary chic rooms and suites, restaurant terrace with fabulous views, and swimming pool. A gourmet spot with a relaxing atmosphere. 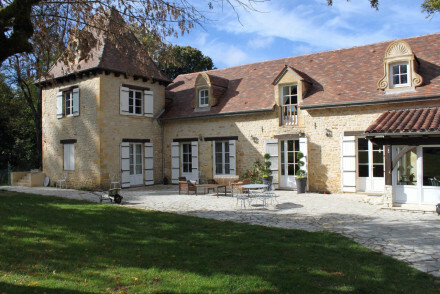 Delightful stone and terracotta farmhouse conversion. Simple rooms with white washed walls, stone floors, wooden beamed ceilings and terraces onto the garden. Swimming pool and breakfast terrace. Laid back and relaxed. Great for families and couples. An idyllic B&B near Biron Castle. Rooms and apartments are full of charm: exposed beams, vintage mirrors, soft colours and beautiful bathrooms. A shady garden terrace and rustic-chic public spaces. A romantic spot for discovering the region. A striking country house turned chic B&B. Beautifully renovated rooms are light and airy with white washed walls, large windows, exposed beams and crisp white linen. Dip in the enormous pool, feast on indulgent breakfasts and use a hotel bike to discover the region. 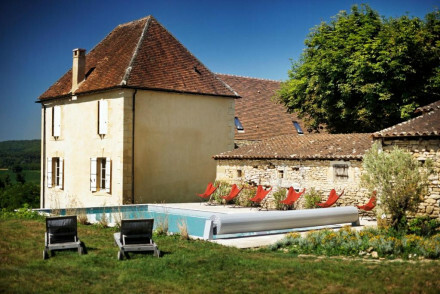 Country Escape - A French rural idyll; large pool, sprawling gardens and chic design. Kayaking - Hire kayaks and paddle down the Dronne. 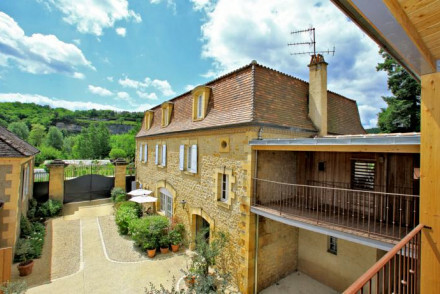 This picturesque B&B is housed in a former winery in the medieval town of Sarlat. The individually designed rooms are modern with some period touches; the family suites offer ample living space and a private sun terrace. Relax in the cosy living room or by the outdoor pool. A charming country B&B. 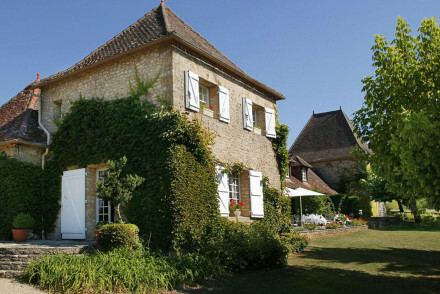 This charming B&B is located in Périgord, overlooking the Dordogne Valley. The cosy rooms have modern interior design with warm rustic touches; the best offer a private terrace with views over the garden. Relax by the heated pool before dining in the traditional lounge. An idyllic rural hideaway. 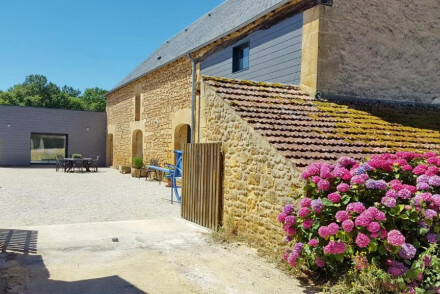 A beautifully converted farm house offering rustic chic accommodation in a beautiful spot outside the ancient town of Sarlat. Rooms are simply styled and spacious with exposed beams and stonework, soft hues and indulgent bathrooms. A large pool and fabulous restaurant make this a special stay. Country Escape - Boasting a tranquil and secluded spot on the edge of a pretty village. The ideal space to unwind in the countryside. Sights nearby - Visit the prehistoric art located within the caves of Lascaux. 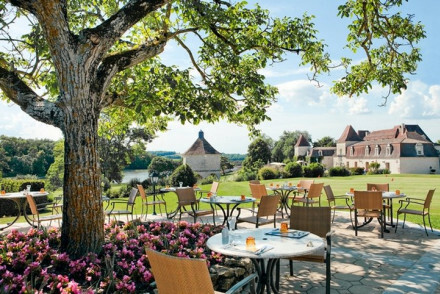 Sat in nine acres of gardens and fields in the heart of the Dordogne, the Chateau de Villars offers total relaxation with all inclusive culinary excellence no matter what your dietary needs. The decor is contemporary with a French romantic twist and the cottage is truly a 'home from home'. Les Jardins de Brantôme is a quiet wonder, just on the outskirts of the town of Brantôme. 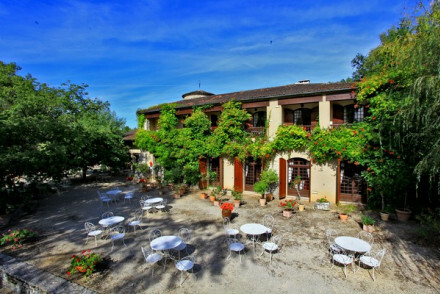 With stylish rooms, a superb restaurant and a magical garden, it makes for an excellent place to stay in the Dordogne. Perfect for couples looking for a intimate, relaxing holiday. Romantic Break - The sophisticated and elegant suites make for a perfect for a romantic break in the beautiful Dordogne region. Active Holiday - An ideal resting point after a long day outdoors, either kayaking, walking, golfing or cycling. Kayaking - Rent a kayak and head off to explore the countryside down the Dordogne river. Great walks - There are numerous beautiful walking trails from the hotel to nearby caves. A striking white manor set in beautifully manicured gardens on the Dordogne river. Traditionally dressed rooms are filled with antiques and decorated with patterned French wallpaper. The service is tip-top and a well priced restaurant offers excellent regional dishes. Country Escape - An imposing country house set in spectacular gardens right on the river Dordogne. Great walks - Enjoy long scenic walks starting straight from the property. Kayaking - Take a scenic kayaking trip along the Dordogne river. 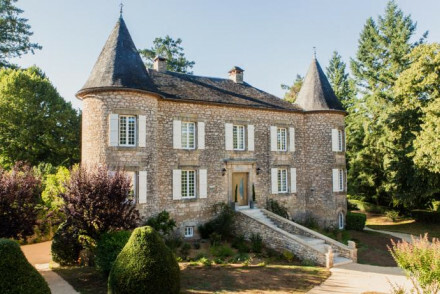 A picture perfect chateau in the heart of the Dordogne. Traditional rooms with floral wallpaper, quaint beamed ceilings and antique furniture. Elegant reception rooms to enjoy a tipple in and an excellent restaurant to boot. Glorious grounds complete with a well sized pool. Come for a relaxing stay. 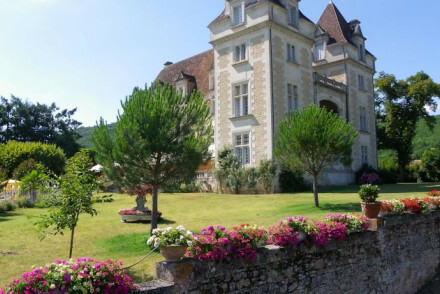 Country Escape - An idyllic chateau in beautiful surrounds perfect for completely unwinding. Foodies - A gourmet restaurant serving up exquisite regional cuisine. Sights nearby - Numerous historic chateaus and cathedrals to visit. The owners will be more than happy to hand out recommendations. Great walks - Lovely walks through the picturesque estate. A delightful hotel in a 16th century watermill. Large rustic chic rooms have exposed beams, warm furnishings and views over the gardens. An outdoor pool, sunny terrace, and lovely, fresh regional cuisine. Quiet, idyllic and full of countryside charm. A Renaissance-style château, with fairytale-esque features and gorgeously renovated interiors. Wonderfully picturesque with turrets and creepers. Beautiful, traditionally-styled, rooms with four-poster beds. 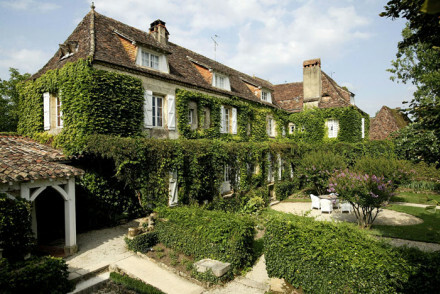 A luxurious jewel in Perigord perfect for completely unwinding. Families - Plenty of room for little ones to run around, plus the glamourous setting is ideal for the adults to find some tranquility. Romantic Break - Gorgeous chateau situated in acres of parkland, boasting palatial beds and rolltop baths, ideal for a peaceful escape. Great walks - This Renaissance chateau is set in 130 acres of stunning parkland and ancient woods, ideal for walking. 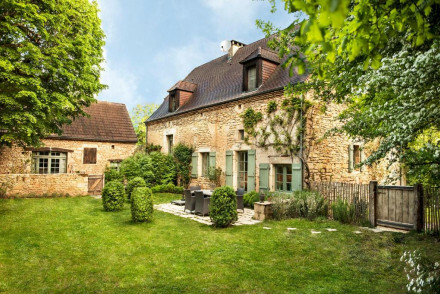 A beautifully restored 17th century 'Maison de Maître' set besides the Dordogne river. A handful of impeccably styled rooms mix traditional and contemporary design to great effect. There's a large outdoor pool, bikes to rent and regional cuisine served. A charming spot to explore the region from. Local exploring - A chic base well positioned to explore the region from. Great walks - Take a stroll through the beautifully manicured Marqueyssac gardens. Sights nearby - Visit the prehistoric caves of Les Eyzies de Tayac and Lascaux. 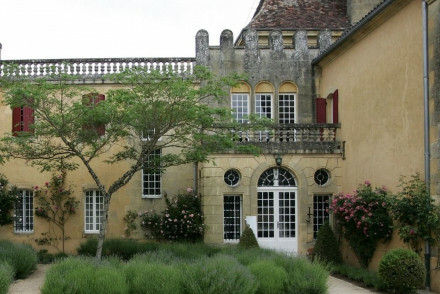 A dreamy sand stone chateau set in the surrounds of golf courses, vineyards and forests. Contemporary rooms in the chateau and in its two separate villas. Two fantastic restaurants, spa, swimming pool, and activities abound. Perfect spot for families, foodies, and relaxers. Families - 2 separate villas perfect for families. Gourmet - Two fantastic restaurants. A simple yet stylish hotel with the relaxed feel of a home from home. Rooms are spacious and comfortable, some with balconies, and suites can sleep up to five. Gastronomic restaurant with lovely outside dining. A good base for exploring and ideal for families, with plenty to do close by. 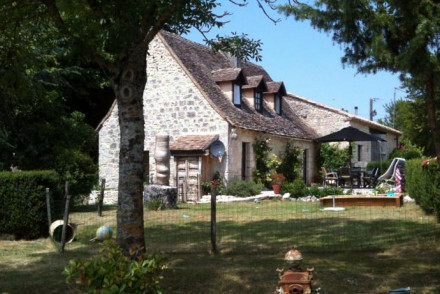 This charming guesthouse is located in Moulin-Neuf within pretty Dordogne. The spacious suites are bright and airy, blending modern and period furnishings. Guests have a private entrance and separate patio area. Relax by the outdoor pool or wander in the magical gardens; a hidden country hotel gem. 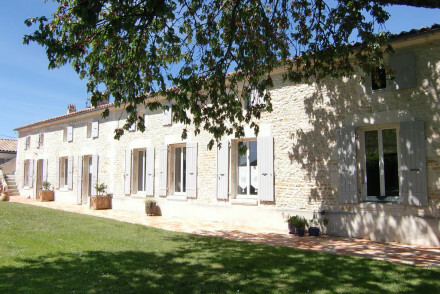 A charming gîte surrounded by beautiful parkland. Design throughout is traditional yet unfussy with exposed beams set against white washed walls and dotted with contemporary art. Play a game of boules on the lawn, swim in the pool or spend days exploring the region. Country Escape - A laid-back gîte set in picturesque countryside, ideal for relaxing rural escapes. A beautifully renovated 17th century house set in acres of picturesque grounds. A handful of chic rooms are the perfect mix of traditional and contemporary styles with antiques sitting against white washed walls and indulgent modern bathrooms set in rooms with beamed ceilings. A rural idyll. Country Escape - A charming rural house set in 40 acres of picturesque gardens. Local markets - Visit the lively farmers market in Bergerac. An elegant hotel, brimming with history, in the pretty town of Montignac. Spacious rooms are individually styled but all are light and airy with high ceilings, antiques and chic bathrooms. A fabulous restaurant uses local produce to fine effect and there's naturally an excellent wine list too. Foodies - Sample contemporary French cuisine at its finest in the hotel's restaurant. Sights nearby - Visit the majestic Château de Castelnaud-la-Chapelle. Kayaking - Take a scenic kayaking trip along the Montignac. A charming guest house set in a the heart of the beautiful village of Domme. 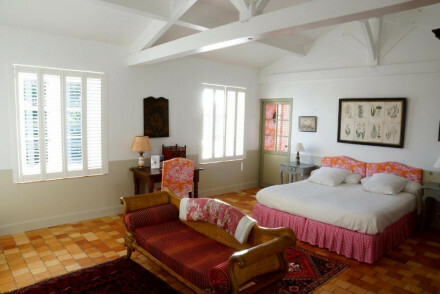 Elegant rooms are traditionally dressed with patterned French wallpaper, terracotta tiled floors and beamed ceilings. Sunny terraces offer beautiful views and there's a cosy fire lit lounge too. 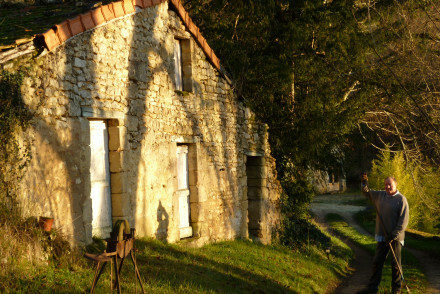 Local exploring - Set in the heart of an ancient village ideal for exploring the Dordogne region. Great walks - Stroll through the village of Domme, noted as one of France's most beautiful villages. Sights nearby - Make a trip to visit the art held inside the prehistoric cave of Lascaux. Situated amidst pretty countryside, this hotel blends rustic country style with contemporary comforts. The ornate rooms are decorated with a choice selection of antique. With an exemplary traditional restaurant, terrace and pool the Moulin de Mitou has all the trimmings for a relaxing rural break. 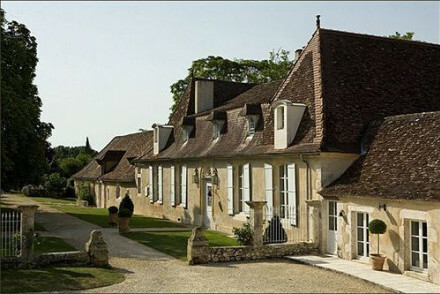 Charming chateau with gourmet restaurant located in the heart of the Dordogne Valley. Interiors feauture original parquet flooring and ornate wood panelled walls. Comfortable guest rooms with scenic views, some with four posters & some that can sleep up to 5. Great for families & local exploring. Sights nearby - Close to Beynac and Cazenac and only minutes from Sarlat, it's an ideal base to travel around the beautiful, historic area. 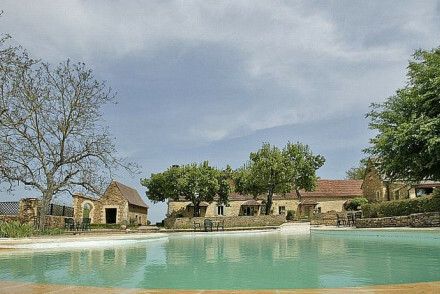 Swimming Pool - South facing outdoor pool with views over to Milandes Chateau. Kayaking - Hire kayaks for the day and spend a day on the river. An idyllic setting, scrumptious food and delightful hosts. 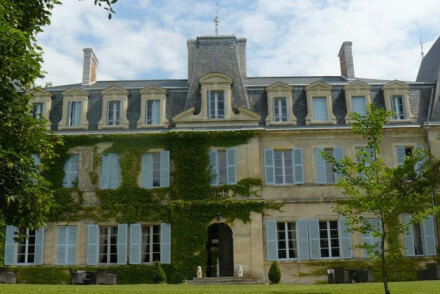 Chateau des Baudry has an abundance of both charm and comfort. The rooms each have their own fireplace and antique furniture and the courtyard, terrace and garden offer a tranquil oasis. An ideal spot from which to explore the Dordogne. 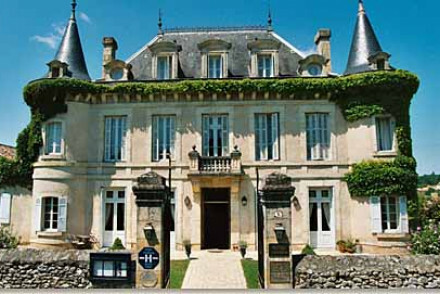 A wondrous 13th chateau-come-hotel in the Dordogne. Awash with character and charm, the hotel is tastefully decorated with a nod to its historical past. Perched atop a mound, it boasts stunning views of the Dordogne valley. A delightful B&B. Romantic Break - The ideal romantic escape, with chic rooms, private terraces, poolside loungers, and acres of parklands to explore. Great walks - There are miles of stunning walking trails around the Dordogne. Kayaking - Go on a kayaking trip down the Dordogne river. 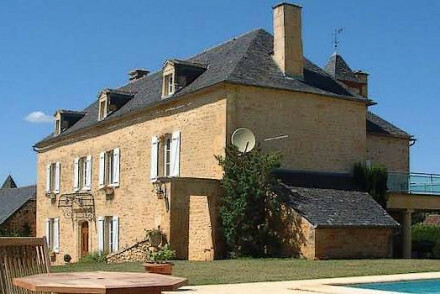 A beautiful 19th century house in the tranquil surroundings of Perigord. Exposed beams, extensive grounds, outdoor pool, bright colours and a terrace overlooking the garden. All the ingredients for a relaxing rural escape in this 4 star boutique hotel. Sights nearby - The grottos of Les Eyzies, Beynac Castle, Montbazillac. A luxurious rural escape set in picturesque countryside. Beautifully styled rooms use natural materials to create light and spacious spaces. There's a heated indoor pool, massages on offer along with yoga and meditation classes. Ideal for totally unwinding. Total relaxation - A tranquil rural spot complete with yoga and massage offerings (it's adult only too). Great walks - Take a stroll through the nearby village of Domme, noted to be one of France's prettiest. Sights nearby - Visit the renowned art set in prehistoric caves. This charming, period B&B is located in the heart of the Périgord Noir. Private access through a chestnut wood leads to the beautiful 17th-century building; rooms are dressed in a heritage style with antique furniture. Swim in the pool before warming up by the fireplace. A pretty country escape. 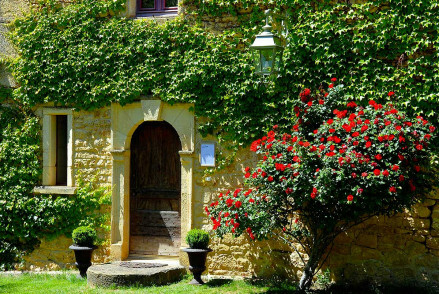 This B&B occupies a beautiful, 18th-century Dordogne mansion. Rooms have exposed stone walls and wooden beams; expect period furnishings and warm linens. Traditional shuttered windows offer spectacular views over the countryside. Relax with wine and cheese on the terrace; an intimate guesthouse. A chic small hotel set in the heart of the market town of Sarlat-la-Canéda. Rooms are spacious and contemporary and some offer self-catering options. Breakfasts are a celebration of local produce and you are just a short walk from the town's main attractions. 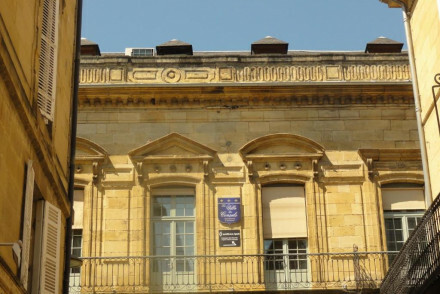 Local exploring - Set in the heart of the historic town of Sarlat-la-Canéda. Local markets - The town's weekly food markets are a must visit. Kayaking - Hire a kayak and paddle down the Dordogne river. A stunning riverside manor filled with antiques and brimming with charm. A handful of individually styled rooms mix contemporary and traditional design to great effect. Indulgent breakfasts are served, there's a large pool and small river beach too. A luxurious base for exploring the region from. Country Escape - A charming country manor set in an enviable rural position along the Dordogne river. Fishing - Fish for some of the river's migratory species such as salmon, sea trout of wild sturgeon. Kayaking - Hire a kayak and take a scenic trip along the river. A lovely family-run manor house on a 6 hectare estate. Charming bedrooms and suites with fabric covered walls and wooden beamed ceilings. Spacious grounds include a swimming pool, a dovecote, and a tennis court. Great for families and groups of friends. Dark mahogany and low mood lighting dominate this renovated chateau. Set in Bordeaux's wine lands it's a cosy hideaway from which to explore the surroundings. Perfect for a restful break with not too many frills. Restrictions on children - Children under 12 are not encouraged. Charming historic mill on the banks of the river. A picturesque stone building with attractive greenery and blue shutters. Two delicious restaurants serving local cuisine with riverbank seating. An enchanting spot for foodies, families and explorers. 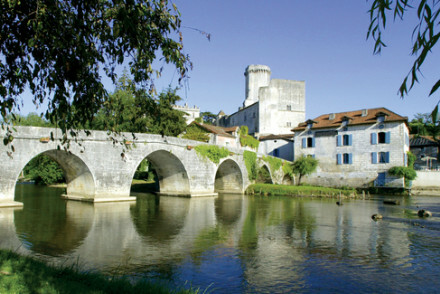 Village - Brantome is the "Venice of the Périgord". Riverside - A beautiful mill on the river front. Views - Fariytale views over the river. Foodies - Two excellent restaurants. Beautiful rooms epitomise this 16th century chateau - fourposter beds and antique furnishings. The Relais is the eco-friendly sister hotel sited next to 27 hole golf course. Cosy spa and Michelin star restaurant. A charming country house offering chic accommodation in a secluded spot alongside the Dordogne river. Suites are expansive and are designed with a perfect mix of traditional and contemporary styles. 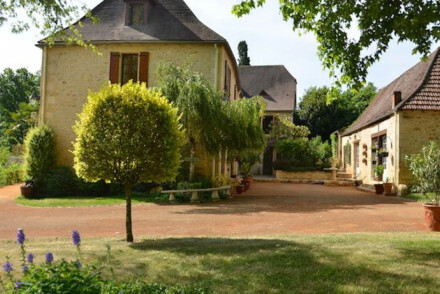 A luxurious and tranquil base to explore the Dordogne region from. Country Escape - A quiet and scenic spot surrounded by beautiful countryside. Sights nearby - Dordogne is said to have 1001 castles and chateaux so there's plenty to explore. 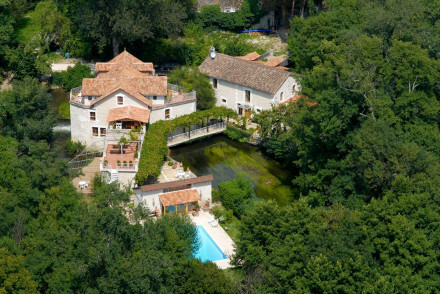 Set amid four acres, this peaceful, adults only chateau has an elegant swimming pool, spa and fitness centre. Pretty, traditional Perigord styling on the outside gives way to modernist interiors with each room individually designed to a specific theme. Ideal for a romantic break in rural France. 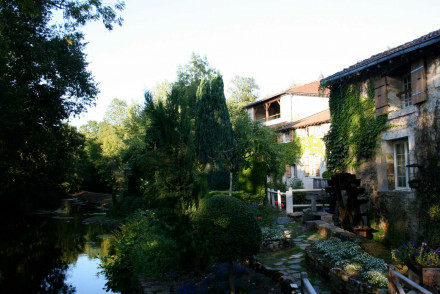 A beautiful mill with a Michelin starred restaurant, tennis court, and swimming pool. Romantic footbridges and terraces lead to luxuriously decorated rooms, suites and an apartment, all with private terraces. Classic furniture, exposed beams, and modern comforts. Very romantic. A charming 17th century manor house in the sprawling countryside. Luxurious and rustic rooms with attractive furnishings and private balconies. Fantastic French restaurant and organic breakfasts in the garden. Swimming pool, views, fresh air. Lots to do in the rolling hills and nearby lake. Families - There's a children's menu at the restaurant. Sights nearby - Chateau de Monbazillac, Cyrano de Bergerac Statue. Sailing - Boating on the lake. A stunning manor house hotel with fabulous restaurants. Bedrooms and suites are lavish, but understated. Rich fabrics, kilims, antique furniture and four poster beds. Splendid grounds and swimming pool. Delicious, romantic, picturesque. Foodies - Two restaurants; gourmet and bistro. This luxury guesthouse is nestled within a converted mill on the banks of the River Dronne. Each floor of the mill is now a self-contained apartment with a separate kitchen and living area; the three apartments are respectively dressed in a classic, warm and luxury style. A charming rural retreat. 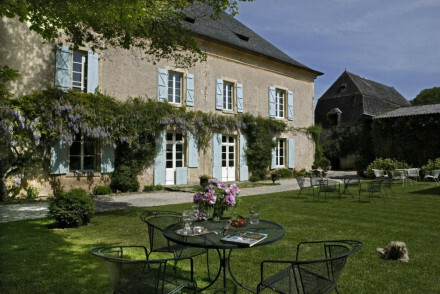 A 12th century estate, turned boutique hotel, in Leydou. From the moment you arrive the relaxed and homely vibe will draw you in. Simple and chic decor dotted with original works by the artist/owner. Chill by the pool, wander through the countryside or sample the wine cellar. Addictively good! Hideaway - The perfect retreat from it all spot, homely chilled out vibes, impromptu starlight dinners and miles of countryside to explore. Local exploring - The surrounding area has many caves, castles and ancient villages to be explored. Great walks - Ask your hosts for advice about which walks and trails to follow, they will happily guide. 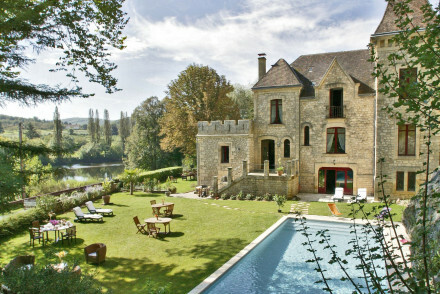 A fairy-tale chateau with traditional rooms & infinity pool overlooking the Dordogne River. Guests can relax in the library, the terrace or their own balcony, or explore the vast array of historical and cultural activities nearby. Perfect for families and groups to recharge their batteries in style.